You need to understand that before we meet up, we extensively discuss the menu for our little get together. This time we decided to go for a Vietnamese main dish. We also decided, from learning perspective that we wanted to make the dishes together and create masterpieces together. 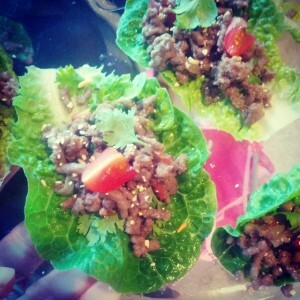 A Viet Food fest was started. Check out the pictures..and indulge! In a wok, heat some oil and add 1/2 of the shallots, spring onions and the chili pepper. Mix in the pork and cook over medium high heat. Bring to taste with the fish sauce and sugar. When done seasoning add the lime juice and mix in the rest of the shallots. Now to assemble your salad. Take a little gem leaf. Add some coriander, mint and tomatoes and cucumber and sprinkle some toasted rice on top. You are now good to go! In a big pan, boil the pork chops with the water and add the tom yum stock cubes. Let this boil for a few minutes. After that, add the tomatoes. In the mean time, make sure to mix the ground pork/beef mixture with the bun rieu cans and eggs. When the soup is boiling, turn the stove to lower heat and let it simmer. Now make sure to drop the egg mixture slowly, drizzling it in a complete circle around the pot. Do not stir, otherwise the egg mixture The rieu will instantly begin to form as the mixture hits the boiling broth. Put the lid on the pan and let it steam for 10 minutes. After that add the tofu puffs and taste the soup and if necessary season it one more time. 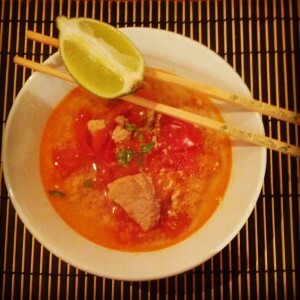 Assemble in a soup bowl, some soup, rieu, tomatoes, tofu with some vermicelli noodles, spring onions, coriander. Serve with a lime wedge on the side. You can add some fish sauce to taste!